Step 1: Preheat oven to 400 degrees F. Line two large baking sheets with parchment paper. Step 2: Heat oil in a large skillet over medium-high heat. Pat meat dry with paper towels. Season all over with salt and pepper. Add to skillet and sear all over, until browned, about 2-3 minutes. Remove from heat and clean skillet. Step 3: Melt butter in the same skillet over medium heat. Add mushrooms and shallots and sauté until tender. Season with salt and pepper. Stir in rosemary and remove from heat. Step 4: On a lightly floured surface, unfold puff pastry. Roll each sheet into a large square, about 1/8″-thick. Cut each into 16 squares. Place one piece of meat onto each square and dollop with about a teaspoon of mustard. Top the meat with about a tablespoon of the mushroom mixture. Fold pastry edges over the meat and pinch to seal. Place on baking sheets and brush with egg wash. Bake 14-16 minutes or until golden-brown. Garnish with rosemary sprigs before serving. 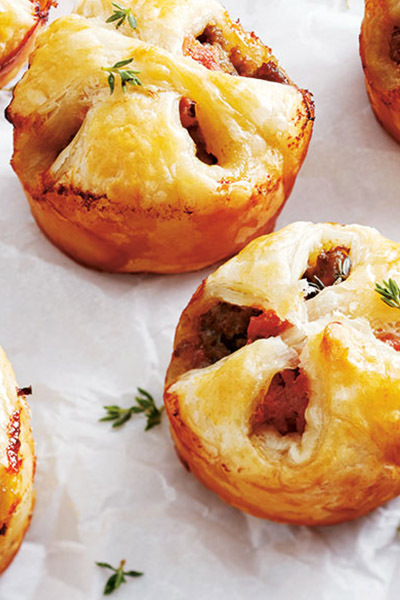 Enjoy these easy beef wellington bites from Delish!